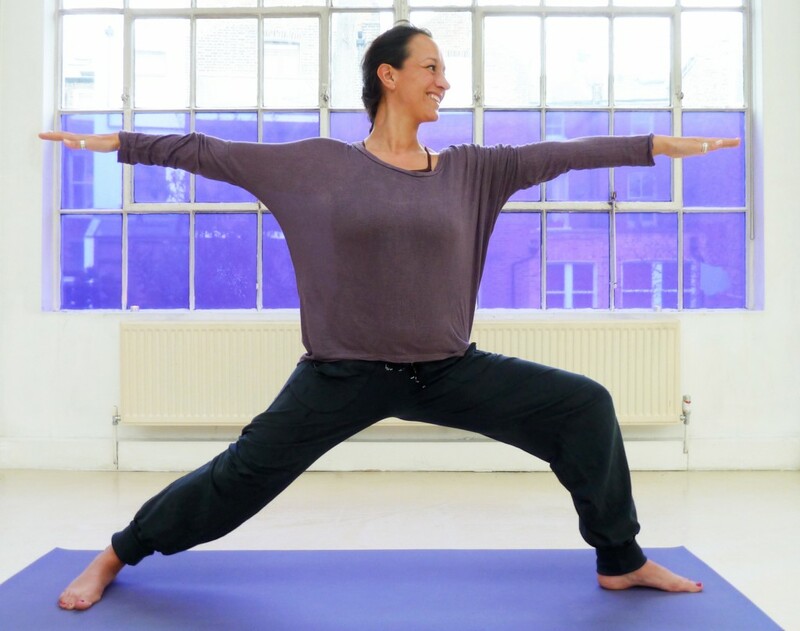 Virabhadrasana II: Warrior II Pose. Virabhadra a fierce Indian warrior summoned to seek revenge after the death of Shiva’s wife. The Hindu story tells us that the powerful priest Daksha threw a huge sacrifice and invited everyone except his daughter Sati and her Husband Shiva, Sati was livid about this and in one version threw herself on the sacrificial fire to teach her father a lesson, in another her anger was so intense she spontaneously combusted. Shiva went beserk. He yanked out a tuft of his hair and beat it into the ground, up popped a nightmarish creature with a thousand heads, eyes and feet and terrible fangs. This was Virabhadra whose name means ‘blessed hero’,Shiva sends him to pay Daksha a visit. Sita is brought back to life and Daksha loses his head and it is replaced by that,of a goats. The name of this posture is a subtle representation of the battlefield within the mind a “spiritual warrior” who bravely does battle with the universal enemy, self ignorance (advidya) the ultimate source of all our suffering. Have your legs wide apart, ideally so that your wrists are directly above your feet, this may be slightly longer than a legs length apart, if this is too hard go as far as is comfortable to you. Turn your right foot out and slightly turn your left foot in. Make sure that the heel of your right foot is in line with the inner arch (in step) of your left foot. Keep your arms out to the sides, palms down. On an exhale bend your right leg. Make sure that the knee is in line with the toes. Your shin should be perpendicular and your thigh parallel to the floor. DO NOT LET THE KNEE COLLAPSE. MAKE SURE THE KNEES ALWAYS FACE THE SAME WAY AS THE TOES. Take your gaze along the line of right arm and beyond your right middle finger. Breath evenly stay about 5 breaths. Then repeat on other side. Can be practiced dynamically inhaling to straighten the leg and exhaling to bend it, repeat as many times as is comfortable. Make sure the legs are strong and firm, you can do this by imagining that your mat is perforated across the middle and you are trying to rip the mat in half with your feet. Without moving the feet see if you can spiral the legs outwards. Now imagine that your legs are like a sword and scabbard and your flesh is the scabbard and the bones the sword, see if you can draw the sword/bones out of the flesh/scabbard. This will give you strength and stability in the posture. When bending the right leg lift the inner arch of the left foot, by pushing into the ground the little toe side of the left foot. To avoid the torso leaning towards the bent leg, still imagine that you are trying to rip the mat in half, so that your weight is evenly placed between both feet. Pull in the pelvic floor and lower abdominals. Keep both sides of the torso long by lifting out of the hips. Keep back of the neck long. Keep a sense of strength and softness. REMEMBER THIS IS THE SPIRITUAL WARRIOR. Strengthens and stretches the legs and ankles. Stretches the groins, chest and lungs, shoulders. Relieves backaches, especially through second trimester of pregnancy- DO NOT HAVE LEGS SO FAR APART IN PREGNANCY. High blood pressure, keep hands on hips. Neck problems: Don’t turn your head to look over the front hand; continue to look straight ahead with both sides of the neck lengthened evenly. Pregnancy keep the posture shorter to avoid SPD (Symphis Pubis Dysfunct). If pelvic floor problems in 3rd Trimester sit across birthing ball or chair. Or avoid posture.